Testing the blood sugar levels after eating is another way of checking if you have taking proper care for your diabetes. Furthermore, it will help those apparently "healthy" individuals catch diabetes in time. In fact, everything you eat influences in raising your blood sugar levels. While you measure blood glucose after eating, you might clearly understand the importance of food in daily diabetic regime. What happens to your blood sugar levels during your meal time? Actually, our body consists of intestines which are responsible to break down the sugar found in the food you eat, into carbohydrates (smaller substances or molecules). These processes are carried out into the bloodstream and in the liver leading to increased levels of your blood glucose. On the other hand, your pancreas takes the signals of high blood sugar levels, and starts producing and launching insulin in order to lower them until normal levels. Now, you must keep in mind that if you're a diabetic, the insulin produced and launched from the pancreas isn't enough to decrease your blood sugar levels. This leads to high blood sugar levels after eating. And when you do measure blood sugar, you may have a higher result from comparing to the normal one. Basically, the test for that is called oral tolerance glucose test. It's performed in two different steps. First, you measure your blood glucose level after fasting for at least 8 hours (i.e. you haven't eaten anything before you go to the lab early in the morning). The next step is to measure your blood sugar level after two hours you've had a sweet drink. 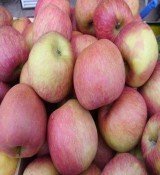 What my blood sugar levels after eating should be? Now, you must understand that in a normal person (non-diabetic) these levels should be less than 140 mg/dl. Meanwhile in cases of pre-diabetes, you should find your blood sugar level between 140 and 199 mg/dl. But, if you're a diabetic, the results you may see can reveal sugar levels higher than 200 mg/dl. 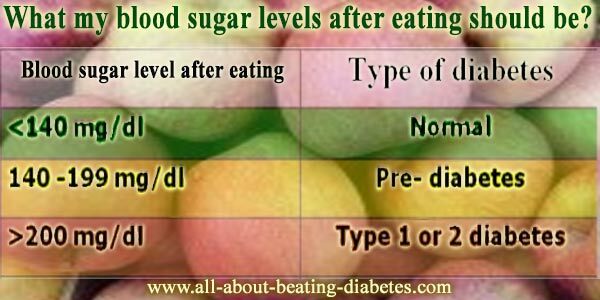 The chart below will give you a better idea on what your blood sugar levels after eating should be. Although you may have high levels of blood glucose, however, this does not mean that you have to surrender. Be strong enough to lower your high glucose readings by following the right steps. Some of these steps include being careful in what you eat and by implementing the right diet & menu according to your needs and disease. If this is not enough, then, can use all in one supplement containing the right herbs, vitamins, essential elements that will help optimize blood sugar levels. Click here for more. Decide to make some changes in your lifestyle habits. Start with keeping acceptable body weight. Exercise will help you on that a lot. Relaxing-exercises to reduce stress and quitting smoking will also help. Find out the right dietary strategy which fits to your case. Be careful about the food you take and count the energy and sugar you give to your body. There are several herbs that have been used since ancient times not only for general health; but also to beat diabetes. You can consider them too. If you want a more personalized help, type your health concern here and get helped by our doctors.